Reviewed by Deep Jyoti Francis Center for Studies in Science Policy, Jawaharlal Nehru University, New Delhi, INDIA. The UN 2030 sustainable development agenda places a huge emphasis on promoting economic growth by catering to social needs ranging from education, health, social protection, and job opportunities while tackling climate change and environmental protection. UN publishes thematic reports, the World water development report (WWDR) which focus on different strategic water issues to facilitate decision making for sustainable development. 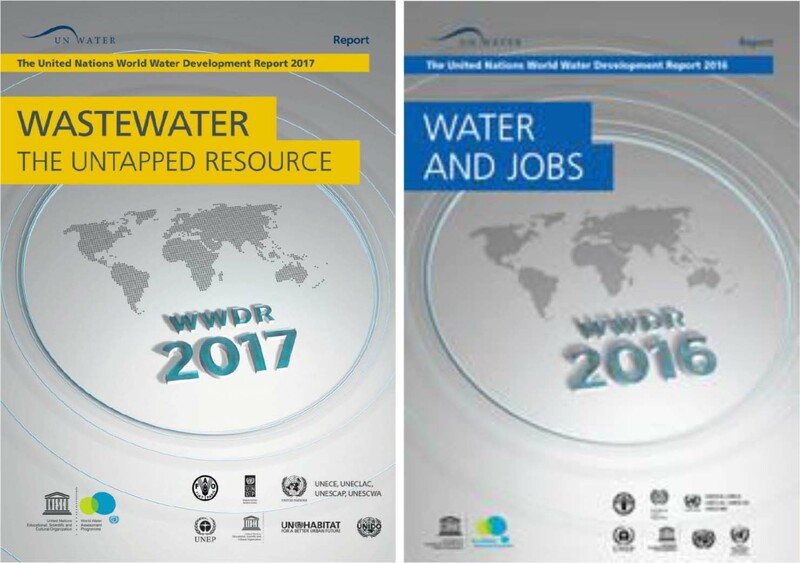 This article is a comparative review of UN-WWDR 2016 which focuses on water and job creation with UN-WWDR 2017 which elucidates on the potential of wastewater. The United Nations World Water Development Report 2017, Wastewater: The Untapped Resource. By United Nations World Water Assessment Programmed (WWAP), UNESCO, Paris, 2017, ISBN 9789231002014. The United Nations World Water Development Report 2016, Water and Jobs. By United Nations World Water Assessment Programmed (WWAP), UNESCO, Paris, 2016, ISBN 9789231001468. The 2030 agenda for sustainable development adapted by the UN member states in September 2015 sets goals to end poverty, protect the environment and ensures prosperity for all. According to the 2017 report, Sustainable Development Goal (SDG) 6 of the 2030 agenda focuses on improvement of water resource management by laying emphasis on drinking water, sanitation and hygiene, water quality and wastewater, water use efficiency and scarcity, integrated water management, protection of ecosystem; international cooperation and capacity building and stakeholder participation. SDG Target 6.3 states: “By 2030, improve water quality by reducing pollution, eliminating dumping and minimizing the release of hazardous chemical and materials, halving the proportion of untreated wastewater and substantially increasing recycling and safe reuse globally” (page 2). The 2017 report highlights the lack of data relating to ‘virtually all aspects of water quality and wastewater management particularly in developing countries as a challenge for SDG target 6.3. For proper governance, the report emphasizes the involvement of citizens in decision making at all levels to promote engagement and ownership. The major focus of the 2017 water report has been on wastewater as the untapped resource. Wastewater is a composed of approximately 99 percent water, and approximately 1percent suspended colloidal and dissolved solids. The report argues that wastewater when improperly managed can have determinant effects on the ecosystem. Wastewater plays a significant role in the water-energy nexus. Chapter 16 of the report argues that wastewater collection and treatment require a significant amount of energy, wastewater itself can be a source of energy, and its vast potential remains underexploited. Accordingly, chemical, thermal and hydraulic energy contained in wastewater can be recovered in the form of biogas, heating or cooling and electricity generation. Energy recovery has been argued to have significant business potential in terms of reducing energy use, operational costs and its carbon footprint and that reducing the carbon footprints of wastewater treatment plants can increase revenue streams through carbon credits and carbon trading programs. Wastewater management does not limit its focus on reusing water on the top of wastewater treatment plants but shifting its focus to converting them into ‘resource recovery factories’ that intend to use the wastewater and sludge as a raw material to recover valuable products for marketing to end users. While in some parts of the developed world new treatment plants are constructed on cutting-edge technologies, there is an increasing call for appropriate technologies matching the institutional and resource constraints of low income countries (technologies that can operate with limited external energy needs and lower installation, operation and maintenance costs than activated sludge systems), while achieving the same performance targets. However, according to the report, the low level of secondary and advanced wastewater treatment in developing countries have indicated an urgent need for technological up-gradation in wastewater treatment and safe use option to support the SDG target 6.3. The need to transfer appropriate and affordable technologies from developed to developing countries has been highlighted in this report. In addition to north-south cooperation, there has been a push for south-south cooperation may assist developing countries in improving their scientific, technological and innovative capacity. The report also proposes the transfer of new technologies, where their application is feasible and affordable should be promoted. Lack of financing has been a major barrier to research and innovation and technological innovation. The need for enhancing knowledge and building capacity has been highlighted by the 2017 report. However, it must be noted that the SDG target 6.3 has frequent overlaps with and preconditions and sometimes conflicts with other SDGs. Water scarcity has been identified as an important barrier to economic growth as well as the creation of decent jobs. Therefore, as compared to the economic and social aspect of water discussed in the report of 2017, 2016 report highlights the impact of climate change on economic activity and job markets. The report highlights that many of the world’s developing economies are in hotspots of water-related stress, particularly in Africa, Asia, and the Middle East. The report defines jobs as an individual set of tasks that will deliver the work within a single enterprise, farm, community, household or other production units, including self-employment. Insufficient and erratic water has been argued to affect the quality and quantity of unemployment in the food sector. Besides constraining agricultural productivity, water availability affects income stability and poor households. Securing and stabilizing access to water involves investments in a long continuum of water management practices in both irrigated and rain fed system. Water is not only building block in the agriculture sector, but it creates job opportunities in energy as well as processing sector such as industrial and fuel production. The right to safe drinking water and sanitation is an internationally recognized human right and is preconditioned to other human rights such as a right to life and dignity. The 2016 report also highlights the overlaps between human rights and that ‘one right facilitated advancement of others.’ The report of 2016 highlights that innovation in the water sector is highly diverse. On the one hand, new technologies may improve existing methods and processes and make them more efficient and cost-effective. On the other hand, disruptive technologies may fundamentally change how water is being used. The latter requires significant R&D investment. The report argues that on the water supply side, biological and physiochemical processes for water treatment have a lot of scope for technological improvement. On the demand side, the report argues that technological breakthroughs are needed to increase the efficiency and productivity of industrial and agricultural use, to achieve financial and economic efficiency and to minimize long-term cumulative negative environmental impact. However, innovation originating in or benefiting the water sectors, both, have been argued to destroy and create jobs. The report called for attention for policy intervention for the creation of jobs in the field of water innovation and to ensure the supply of required capacity for the generation and diffusion of water-related innovation. The UN water report 2016 establishes the relationship between water, jobs and sustainable development. The two reports highlight that water touches and generates various aspects of livelihood. Wastewater has gained a whole new perspective in these two reports from an employment point of view and reuse of water as raw material. Though the 2016 report throws some light on water, water-related jobs, and sustainable development, the 2017 report lays greater emphasis on technological aspects with case studies of wastewater reuse for sustainable development. 2017 Phcog.Net. This is an openaccess article distributed under the terms of the Creative Commons Attribution 4.0 International license.